Decided to start this thread showing some of the stuff I've been carrying on various trips. The first part will be mostly related to the equipment I always bring, and the second part will cover some of the camping and travel gear my wife and I used while touring the USA this summer. First up are the tools. 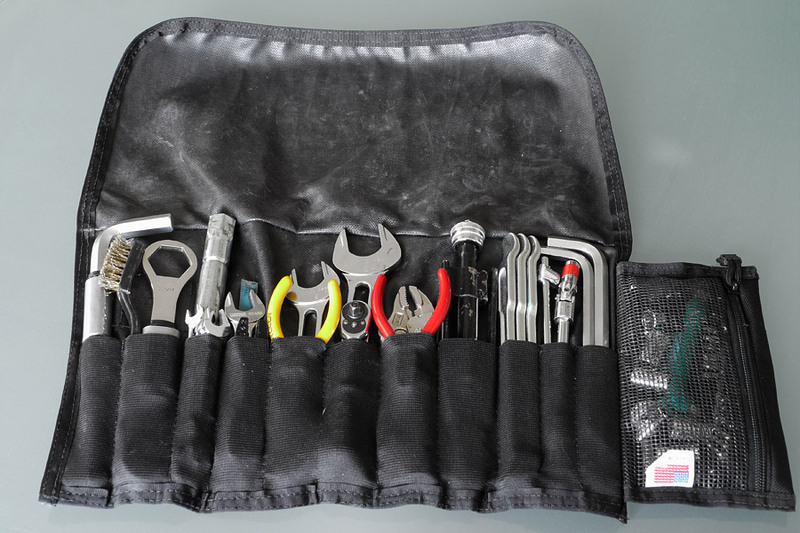 Most bikes come with horrible quality toolkits, hardly the stuff you want to rely on when you're out on the road. 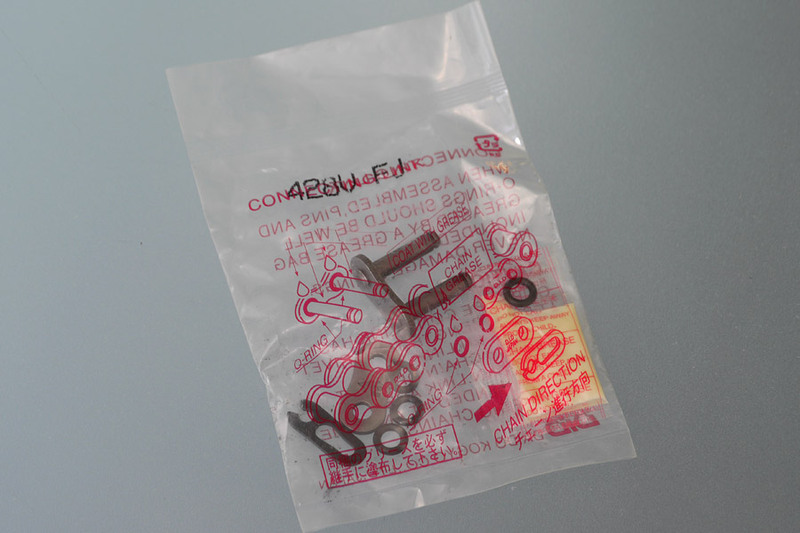 If you're in China, a quick trip down to the local tool market and you can make a nice quality kit for very little money. Roll some electrical and duct tape around the handle of a large tool and put some zip ties on to keep it from sliding. 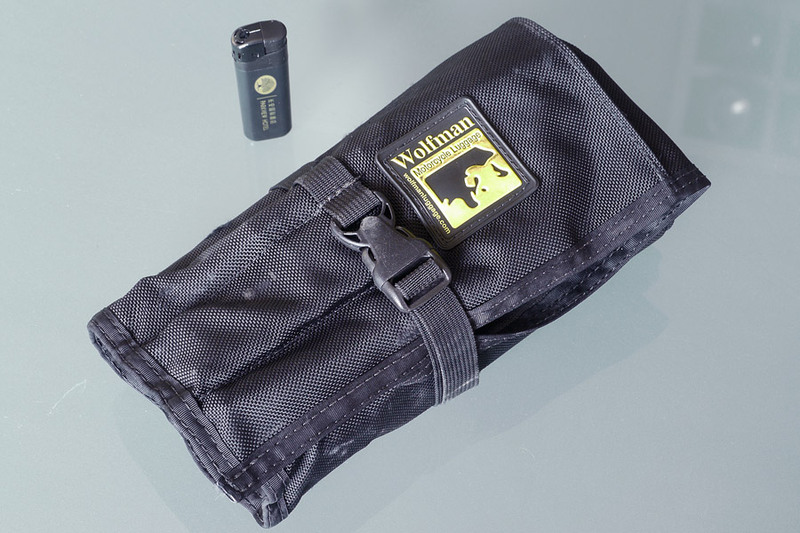 The Wolfman toolbag is from America and I've had this one for over 5 years. Still looks like new and will probably last another 10 years. All rolled up and ready to go. The lighter gives you an idea of the size and is also one of those handy things you don't want to forget. 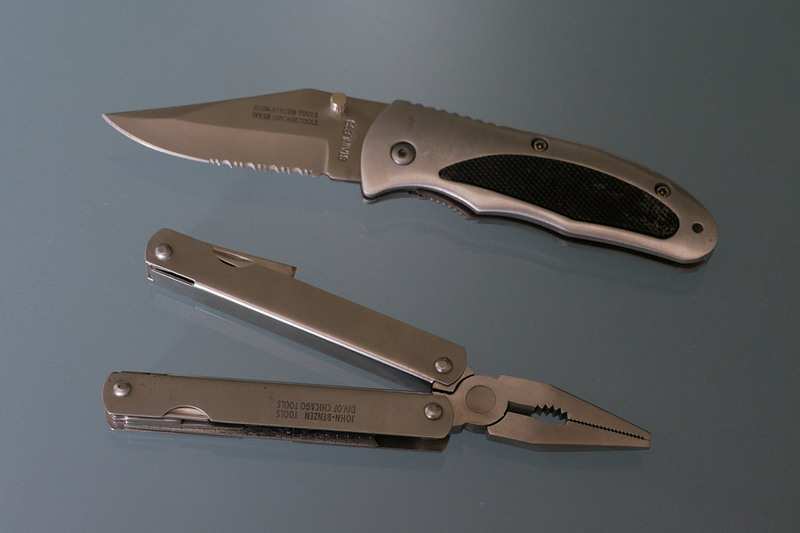 I always carry a leatherman and a knife in my tank bag or side pocket. 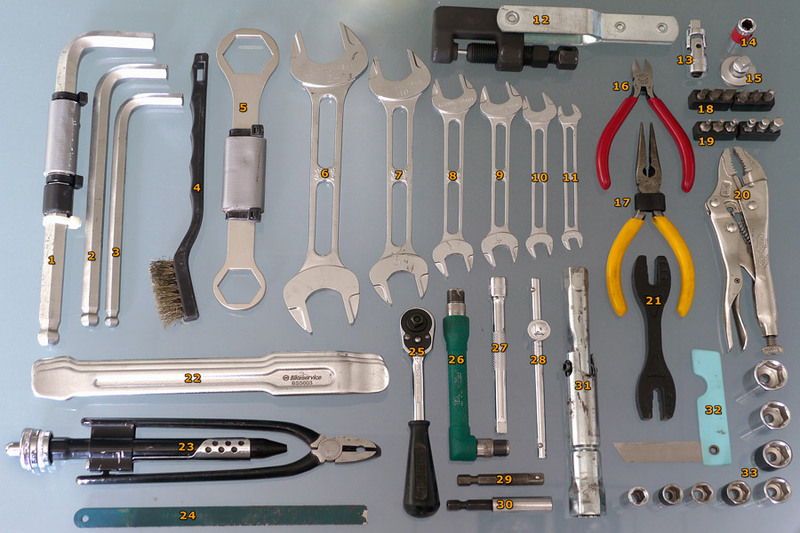 A lot of simple things can be fixed or adjusted with these which takes less time than breaking out the larger toolkit. 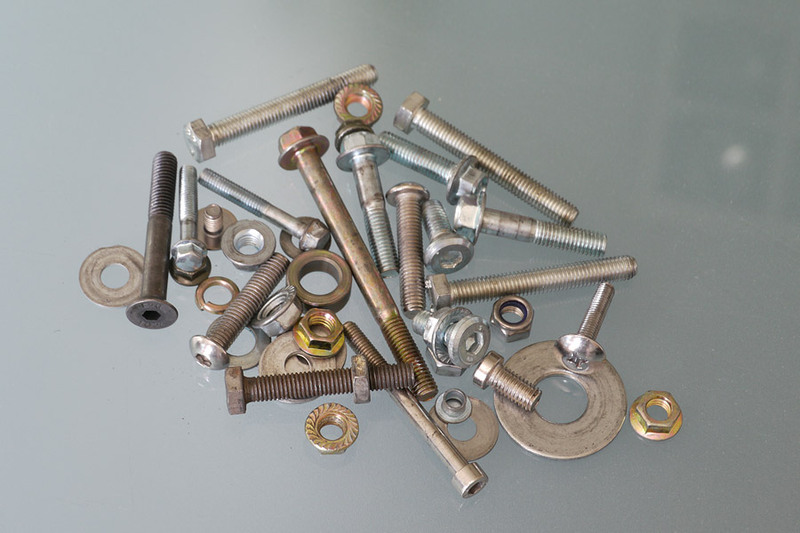 An assortment of popular nuts, bolts and spacers always seems to come in handy. Not a bad idea to add some helmet faceshield screws as well. 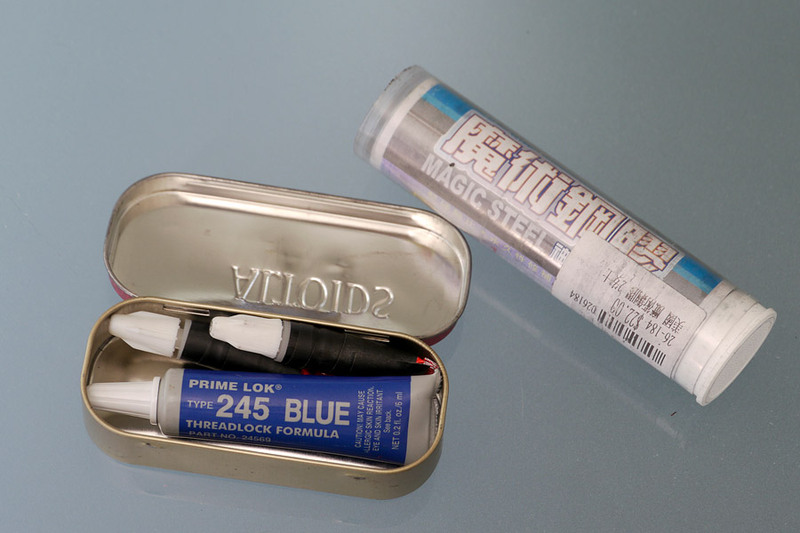 Locktite, super glue and liquid steel are great for temporary fixes. 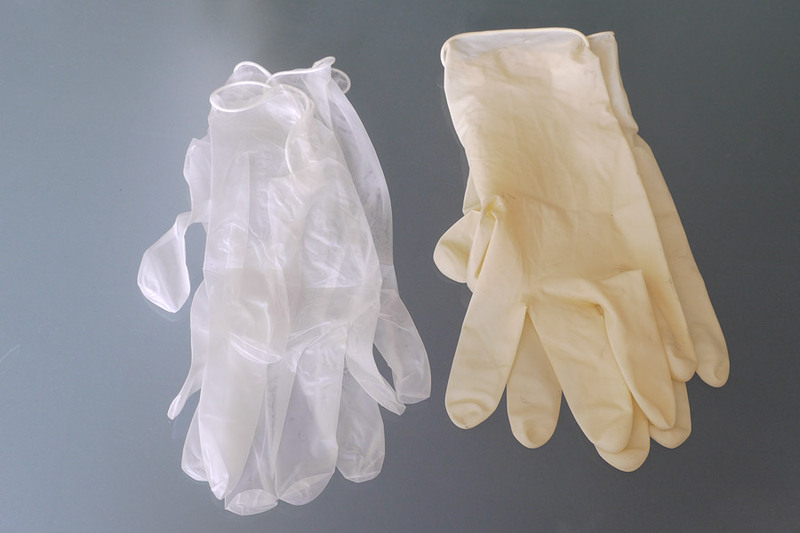 Rubber gloves from the hospital or food prep industries are great for messy repairs. 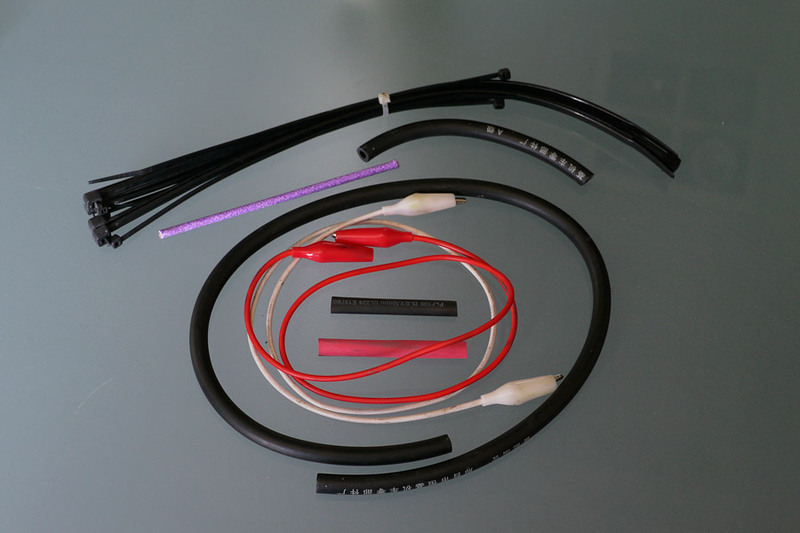 Some fuel line, shrink tube, zip ties, piece of coat hangar and alligator clip wires can fix just about anything. Tiny multi-meter for figuring out electrical issues. 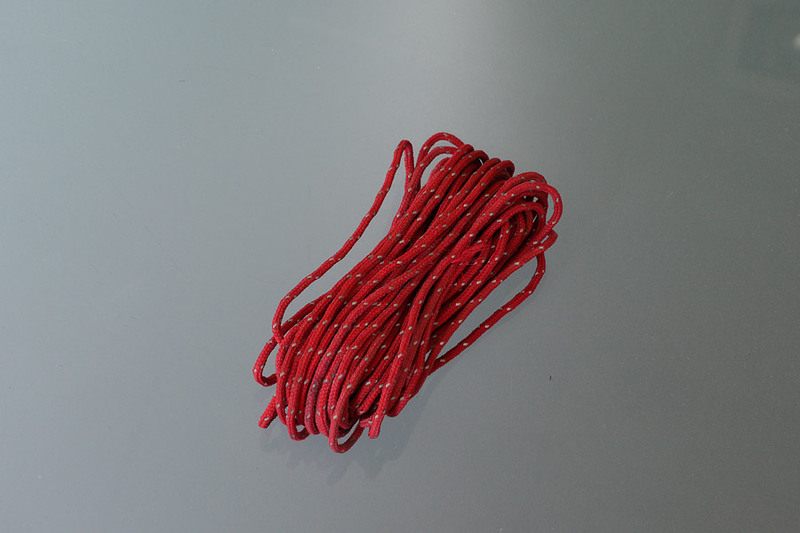 Parachute cord or tent rope is very light and amazingly strong. 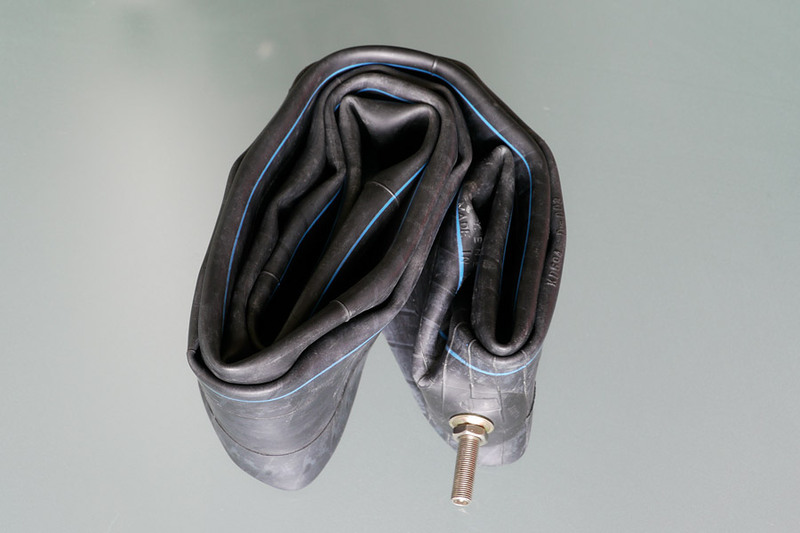 Good for tying stuff down, hanging clothes, or towing your bike. I keep all these supplies packed in a small cassette tape bag that is padded. 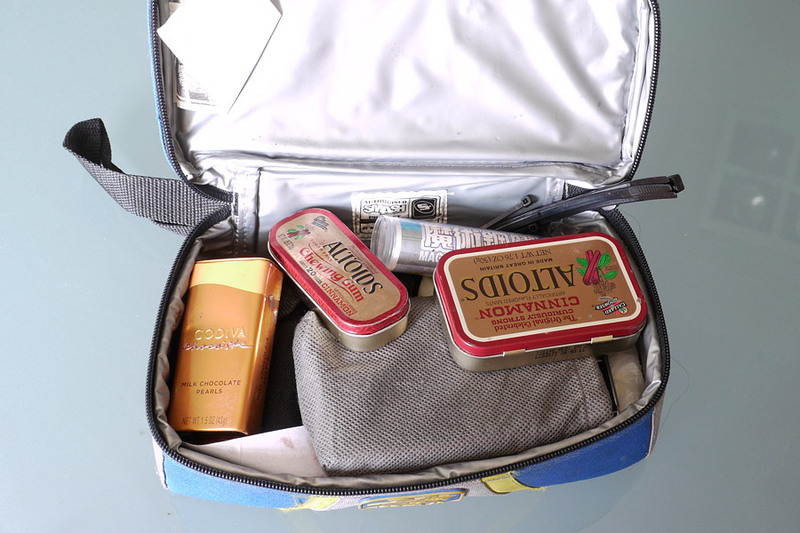 Candy tins are a great way to keep things like glue from opening up and making a mess while out on the road. A few spare parts that I usually car on longer trips. A master link is absolutely vital and I recommend carrying two as a broken chain can really spoil your day. Make sure you get the exact same brand as the chain you buy as I have seen many cases where links won't fit from different manufacturers. A spare shift lever is nice if you have the room. 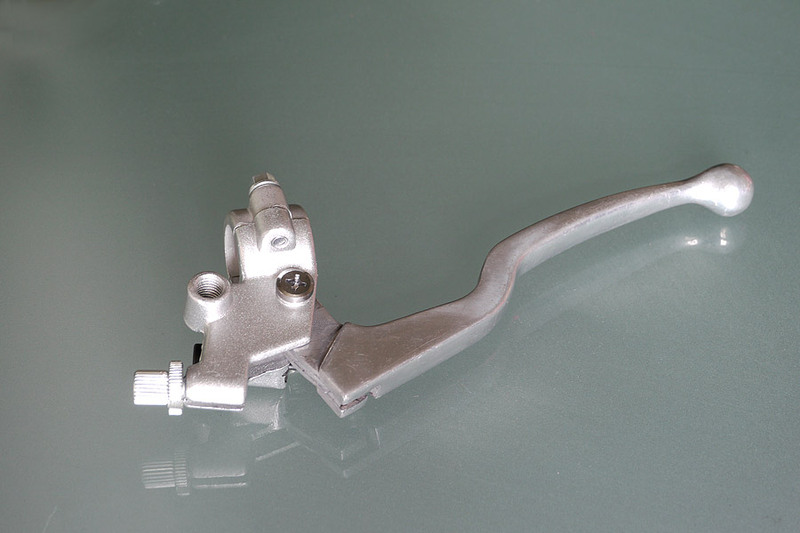 Clutch and brake levers are easily broken if you don't have handguards. An extra tube is pretty much mandatory for riding in China. I also carry a spare clutch cable and spark plug. That's the first part of my list, feel free to add more. ChinaV, you made my day! now we Germans are out of the "cold wind". normaly everybody is laughing about our trip preparations. you top it! thanks! Hmmm.... I wonder if that comes from all the work I've been doing with German companies over the last 10 years. Good work, good work. Great idea for a post. I have all of that, and more. On the bike my kit is 'similar' to yours, just a wee bit smaller - at least, I always carry a cigar lighter and a knife .... the rest of the kit usually sits in the shed unfortunately and is always missing the actual bit that drops off!!!! I wish you had posted this a few days ago and I might have packed it on the bike! Today it was the gear lever that fell off and as I had gone a fair way since the last change, it was a loooong walk along the roadside - I rode back twice looking, stuck in fourth gear so too fast to see properly so eventually had to walk a couple of km. to eventually find it in the grass which was fortunate. I would have used the 'mole grip pliers' in an emergency, if they hadn't been in the shed at home. Looking forward to seeing the camping gear as I have a couple of day packs made up for bow-hunting and for bush-fire emergencies, it will be good to compare. Mine are 'cheap and cheerful' components but do the job in this climate. Today it was the gear lever that fell off and as I had gone a fair way since the last change, it was a loooong walk along the roadside - I rode back twice looking, stuck in fourth gear so too fast to see properly so eventually had to walk a couple of km. to eventually find it in the grass which was fortunate. I would have used the 'mole grip pliers' in an emergency, if they hadn't been in the shed at home. That you found the lever is amazing, and should be taken as a sign of your good karma. Sometimes things fall off, rarely are they found. Yeah, it was a strange feeling to try and change down just before entering a bend and the foot just pressing on air! The funny thing was I had no real idea what it looked like (just a brain glitch) but it was indeed good karma as the black rubber tip was just sticking up a bit, the rest of the lever was covered in mud and lost in the background. I will get my 'emergency pack' out of the car tomorrow and check it through before the summer fire-season, so thanks for the timely reminder! We have some good debates on the bow-hunting forums about the best brands for gear but not much about the actual contents and necessities, with some variations depending on climate zone and electrical toys. Will post pics later. 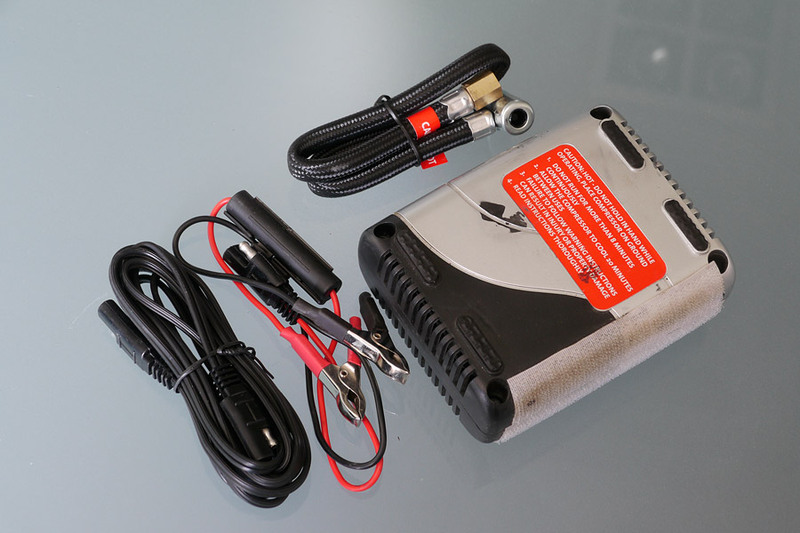 This is great - thanks ChinaV - it helped me realize the deficiencies with my current roadside kit (a mobile phone with my sweety on speed dial). I laugh now at my ignorance about "prep" from when I first started "touring" (motorcycles had just been invented). I'd pack lots of oil, a full set of spokes (like I'd be able to respoke a wheel on the side of a road), and assorted other useless trash. About 40 pounds of "just in case", instead of the basic essentials like beer and cigarettes (which are amazingly quite useful on the side of a road). You're kit seems bang on - now I just need to find the Beijing tool market. If Beijing is anything like Shanghai, the local tool mart will blow your mind. Yes, tools have advanced a lot since the time motorcycles were invented. You can probably still buy pre-bloodied clubs and sharpened obsidian chips, but China's tool scene is astonishing. In Shanghai it's an entire district of town, block after block of multifloor tool emporia where you can buy anything from near-microscopic forceps to industrial drill presses the size of ChinaV's Weeee or bigger. At the center is a huge tool supermarket with counters representing all the various Chinese manufacturers, and there are many, given that lots of tools around the world of course are made here, including those in chains like Harbor Freight (though Sears, I think, still makes Craftsman tools in the US). So you'll see quite a bit of redundancy here, at very competitive prices. 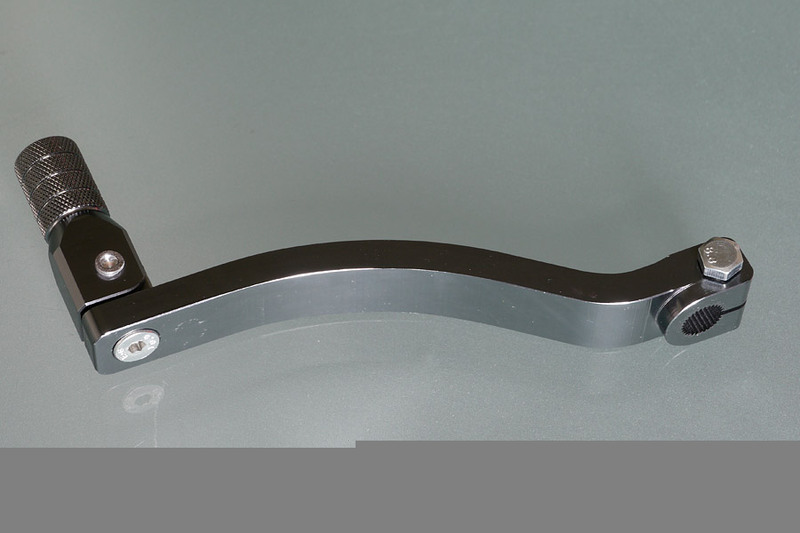 A great brand is SATA, which has excellent bang for the buck, in quality terms. The tool mart here is like a tourist destination. I always see middle aged guys from around the world wandering around like kids in a candy store, muttering things like, "Oh, man, I could use one of those!" "Jeez, check this out!" and "Whaaaa!" I live in a high rise and don't have a workshop, so I appreciate anything that can help keep my tools in order. 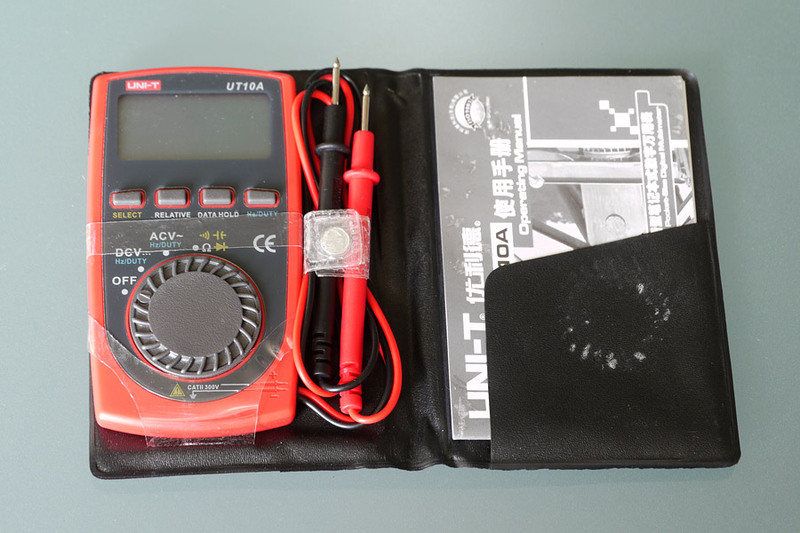 SATA has a couple of different "automotive kits", one of which I bought for under 600 RMB and includes a broad selection of sockets, box wrenches, screwdrivers, pliers and some specialist things like sparkplug extractors -- all in a nice hard case. You wouldn't want to carry the case when riding, but this is the moral equivalent of a big wallboard where every tool has its special hook. So now I'm in the market for something like ChinaV's Wolfman pouch. ChinaV, thanks indeed for kicking this off. Tons of food for thought in your post. By the way, do those tire irons nest together? Euphonius, this tool market sounds epic. Is there a bar there too? I reckon it could be a perfect place to host the weekly bike meet. I cannot think of a better place to get drunk and creative. And to anyone who might think that ChinaV is over-packing, almost everything in there got used plenty during our south china tour in may! If Beijing is anything like Shanghai, the local tool mart will blow your mind. Jeff, could you point me in the direction of the tool mart in Shanghai? I have passed by a few districts in some old sections of town with lots of tool shops but not sure if it is the one you indicated. Thanks in advance.